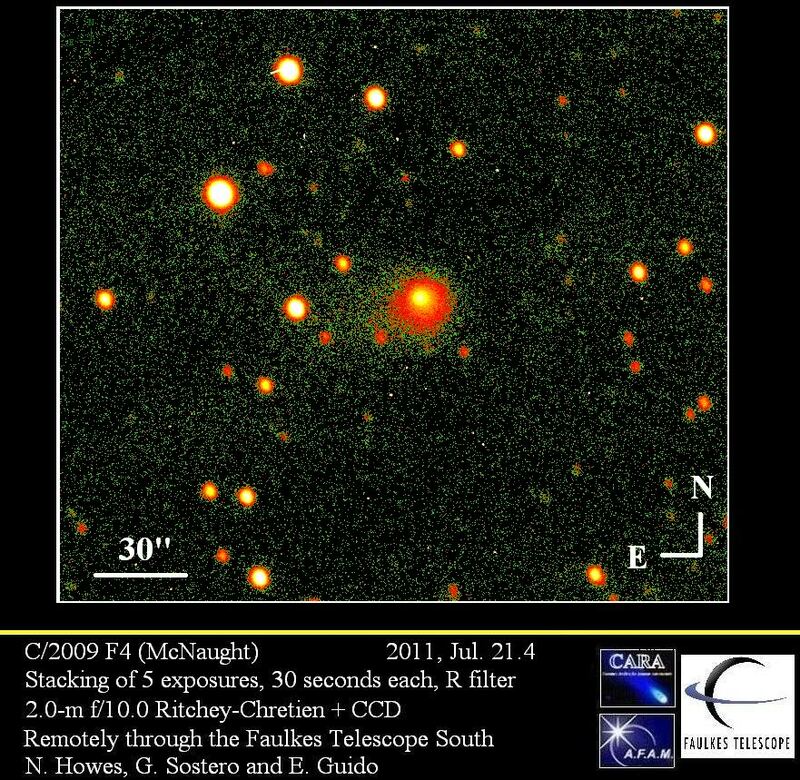 Following the posting on the Central Bureau's Transient Object Confirmation Page and on VSNET-Alert 13560 about a possible Nova in Lup we performed some follow-up of this object remotely through the 2.0-m f/10.0 Ritchey-Chretien + CCD of Faulkes Telescope South (MPC Code - E10). Astronomers at Stony Brook University report on The Astronomer's Telegram 3536 that a spectrum of the possible Nova Lup has been obtained on 2011 Aug 9 at 00h19mUT. 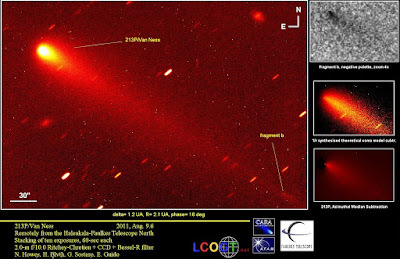 This was obtained with the SMARTS 1.5m RC spectrograph at Cerro Tololo and confirms that the eruptive object in Lupus is an Fe II nova near maximum. 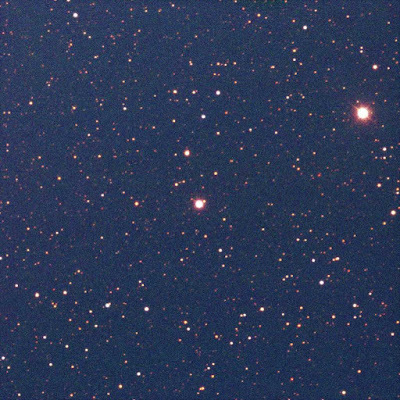 The spectrum (3700-5400A at 4.1 A resolution) shows the Balmer lines of hydrogen (H-beta through H-10), and Fe II multiplet 42, in emission with P Cygni absorption components at a velocity of about -1000 km/s. The equivalent width of H-beta is about -130 A. On August 9, 2011 we have obtained follow-up images of comet 213P/Van Ness + fragment. 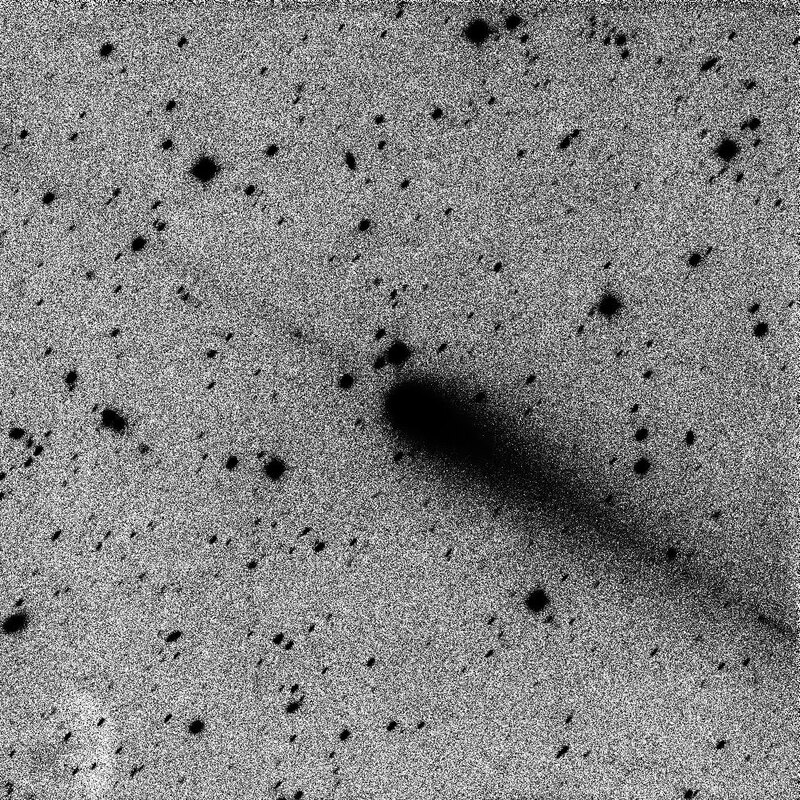 Stacking of ten exposures, 60-sec each, obtained remotely from the Haleakala-Faulkes Telescope North on 2011, Aug. 9.6, through a 2.0-m f/10.0 Ritchey-Chretien + CCD + Bessel-R filter, under good seeing conditions, shows some evolution of the fragment "b" of comet 213P. 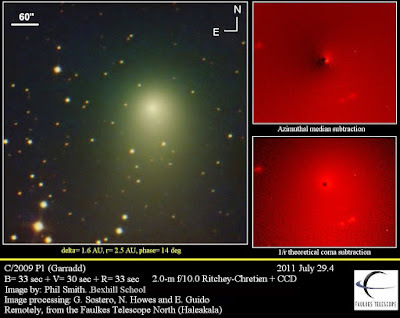 The brightness of its central condensations appears to be dropped by about half a magnitude, compared to our previous observing session on 2011, Aug. 5.6. The central condensation itself appears now elongated, extending nearly 3" in PA 235. The tail of this fragment has been measured to be nearly 16" in PA 233. 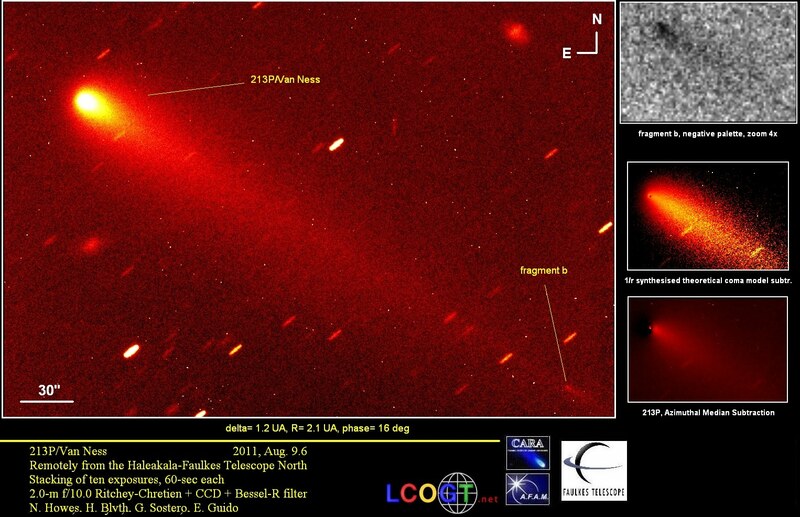 BBC Television in collaboration with Faulkes Telescope and LCOGT today imaged C/2009 P1. 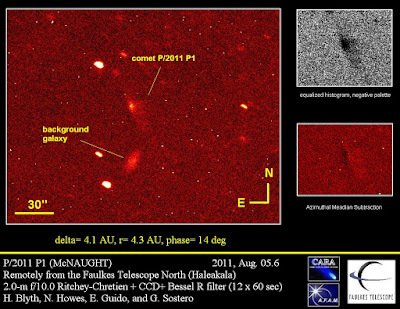 The images have been taken with the 2.0 meters "Faulkes Telescope North" by D. Ó Briain, BBC Television presenter. The BBC were allocated time on FT North (F65) as part of a new Citizen Science project. 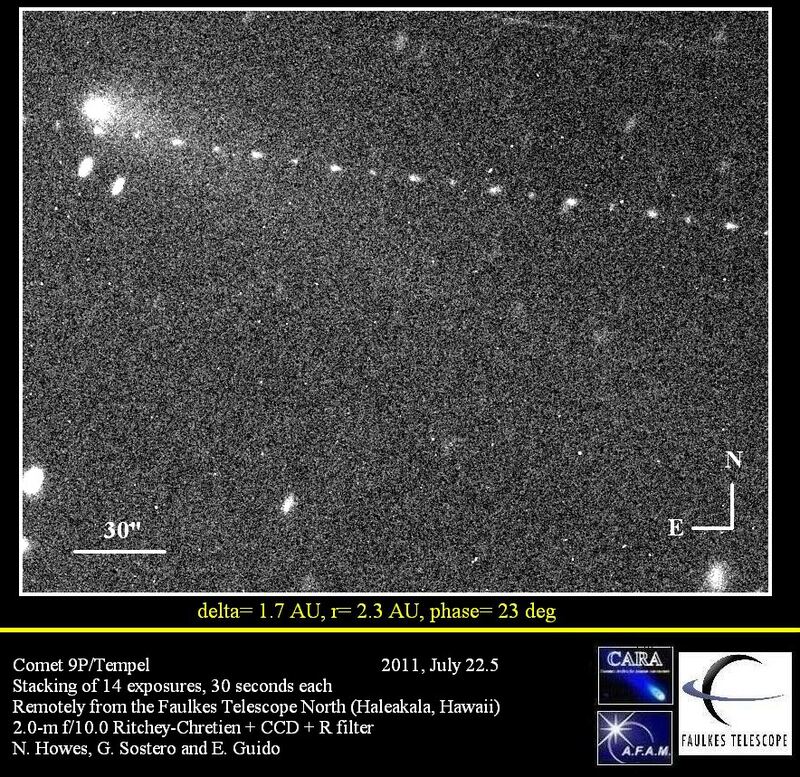 We accessed with permission the resultant FITS data and our team processed the V channed with a few algorithms (the R and B fits have the comet a little trailed, so they were not usable for this purpose). We have detected hints of a plume-like feature exiting from the central condensation. 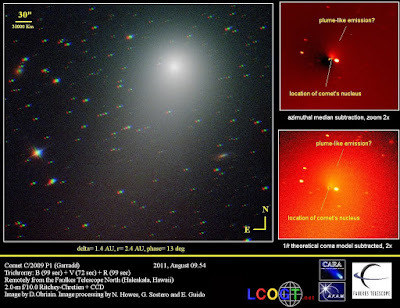 This might be related with the sublimation processes within the inner coma/nucleus of the comet (asymmetric gaseous emissions toward the Sun + line of sight effect). 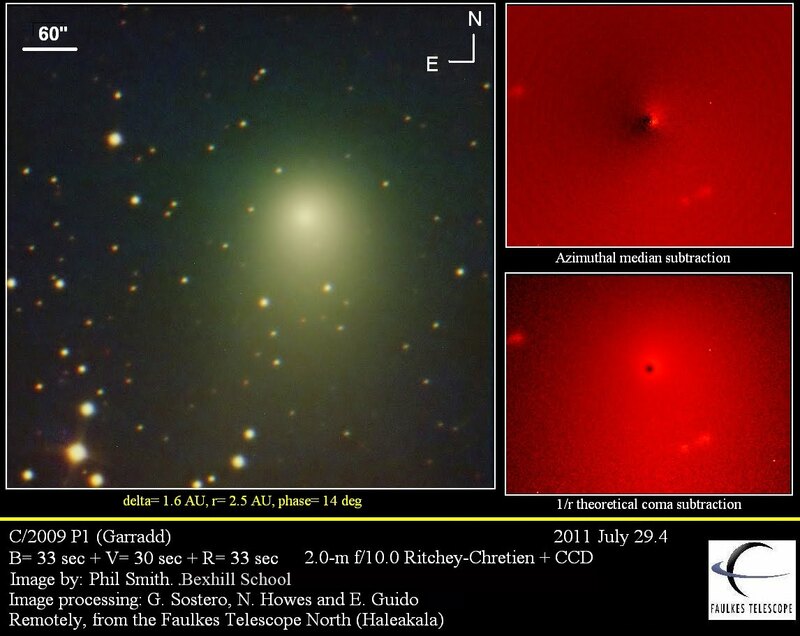 It's an effect frequently seen in active comets near enough to be resolved. Cbet nr.2779, issued on 2011, August 05, announces the discovery of a new comet (discovery magnitude 18.5) by R. H. McNaught on CCD images taken with the 0.5-m Uppsala Schmidt telescope at Siding Spring on August 1.7, 2011. 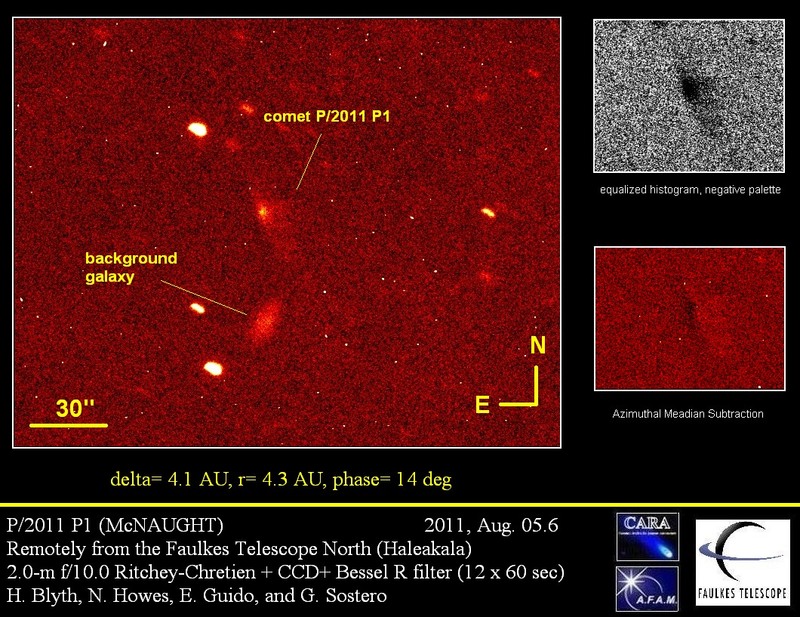 The new comet has been designated P/2011 P1 (McNAUGHT). Stacking of 12 R-filtered exposures, 60-sec each, obtained remotely, from the Faulkes Telescope North at Haleakala on 2011, August 05.6, through a 2.0-m f/10.0 Ritchey-Chretien + CCD under good seiing conditions, shows that this object is very diffuse and elongated toward the northeast/southwest direction (possible anti-tail?). Moreover it is present an apparent tail toward the north-west. 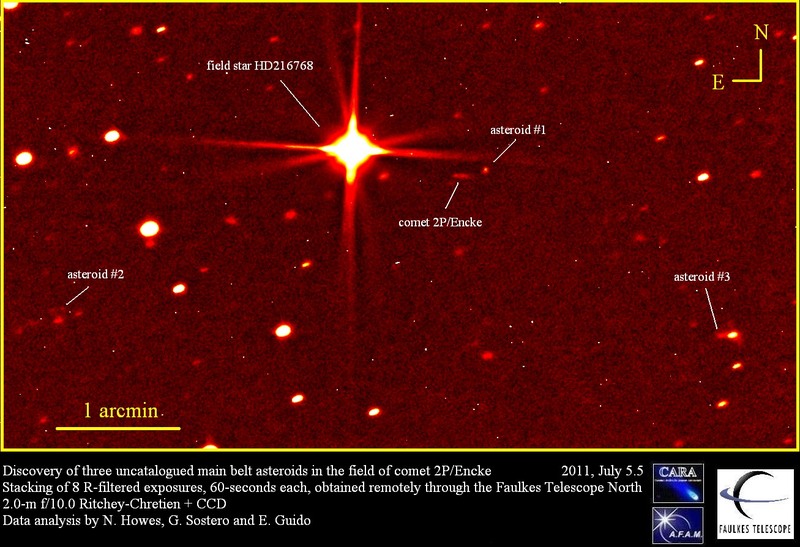 According to COCD webpage this is the 80th comet for the Siding Spring Survey and the 64th for McNaught. 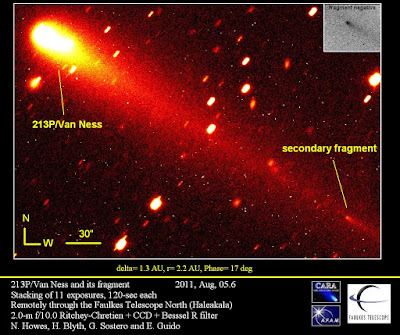 Today, during our observing session with Faulkes Telescope North we observed a fragmentation event in comet 213P/Van Ness. 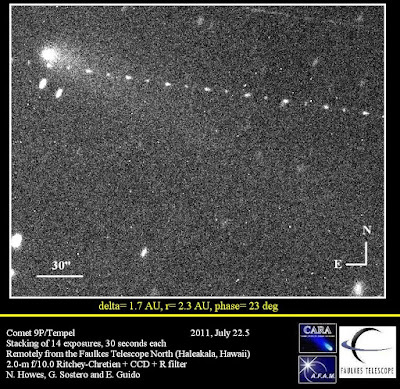 Stacking of five exposures, 120-sec each, obtained remotely from the Haleakala-Faulkes Telescope North on 2011, Aug. 5.5, through a 2.0-m f/10.0 Ritchey-Chretien + CCD + Bessel-R filter, under good seeing conditions, shows the presence of a secondary fragment embedded in the tail of comet 213P/Van Ness. This object, we named "parte-b", was placed about 5.3 arcmin in PA 239, with respect to the central condensation of the comet. It shows a tiny coma nearly 5-arcsec in diameter, with a tail of at least 22-arcsec in PA 235. Its m1 is R about 20, while its central condensation has R about 21. 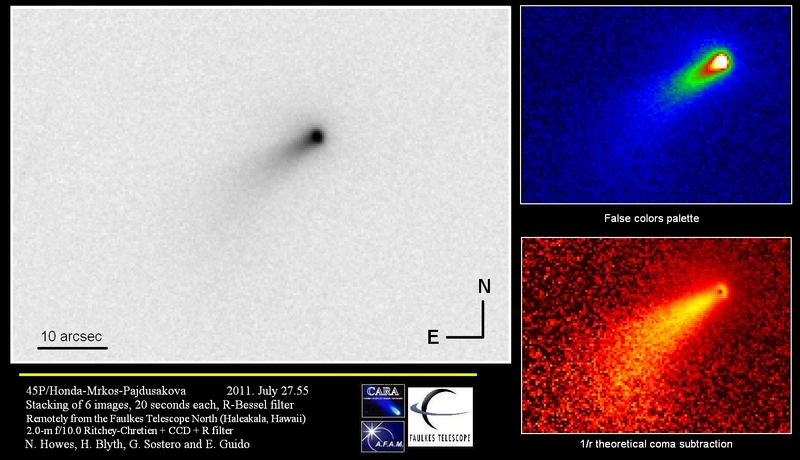 A confirmatory observing session with the same set-up, has been obtained on 2011, Aug. 5.6: stacking of six exposures, 120-sec each shows again the fragment in the expected position, moving with the same proper motion of the comet. Thanks to a new "Faulkes Telescope" Project allowing amateur astronomers and schoolchildren to team up to follow-up small bodies of the Solar System, recently we have been able to image many comets and neos. Below you can see a selection of our targets. 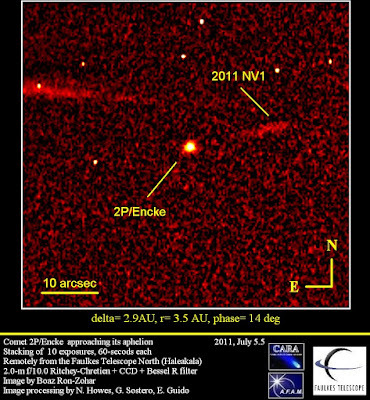 All the images have been taken with the 2.0 meters "Faulkes Telescope North" & "Faulkes Telescope South". Click on the images for a bigger version (details are in the caption of each photo). During our follow-up of known comets and Neo-cp objects, we have found many new main-belt minor planets (at least 15 in the past few weeks). Thanks to the help from schools involved with the Faulkes educational program, we have been able to improve the observing arc and orbital data for these new objects and as a bonus we have received the discovery asterisk from the Minor Planet Centre for many of them. 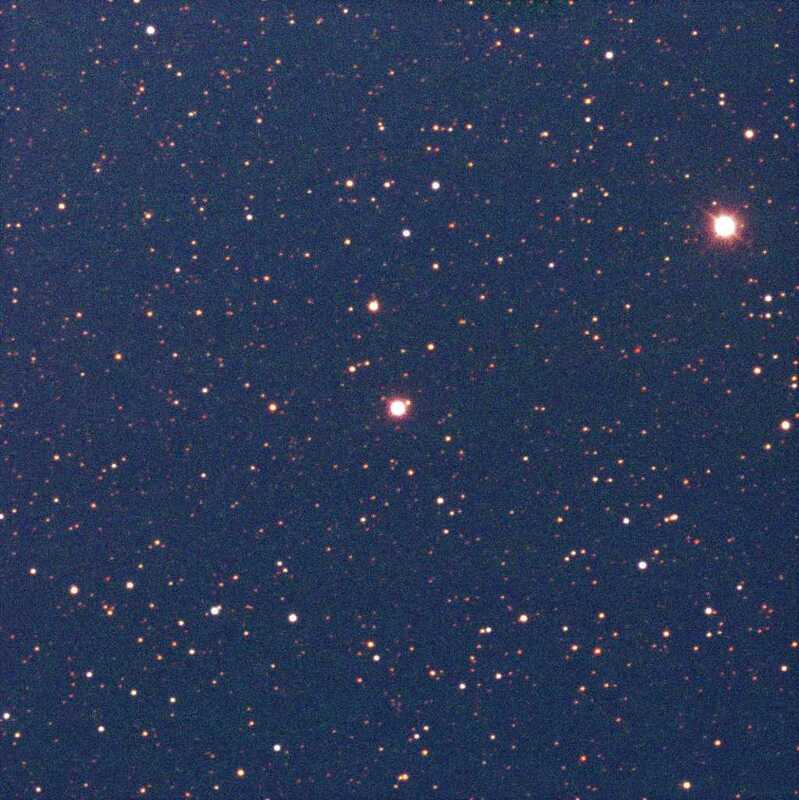 While in the field below imaged by teacher Boaz and his students during their 2P/Encke campaign, we found 3 uncatalogued new minor planets that we submitted to the MPC (the faintest was magnitude 21).